The iPhone 6 is about to become one of the biggest upgrades in iPhone history, with expectations for not one, but two larger-screen models: a 4.7-inch iPhone 6 coming first in the fall, and a 5.5-inch model to arrive shortly after. 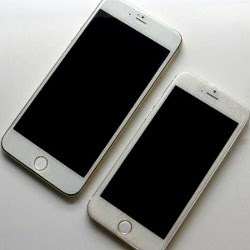 While we’re still months away from their official unveiling, Sonny Dickson, the Australian kid who made a name for himself last year, leaking pre-release images of the iPhone 5s and 5c, now strikes again with full mockups showing what the 4.7” and 5.5” iPhone 6 are very likely to look like. just small strips of plastic that almost do not interrupt the apparently aluminum matte back of the iPhone 6. Interestingly, Apple seems to have also ditched the pill-shape dual-tone flash in the iPhone 5s for a simpler, round one (a single one seemingly). Up front, you can see how the 4.7-inch iPhone has a fairly sizeable bezel, while the 5.5-inch one, in contrast, has almost non-existent side bezel, and is very compact for its size. Pictures of these next iPhones come in white, gold, and gray, the already established iPhone color palette. And while this is not the first iPhone 6 leak (Taiwanese pop star Jimmy Lin posed with an allegedly leaked iPhone 6 a few days ago), it looks like the most detailed one, coming from a proven source. We can imagine the secrecy-loving people at Apple are not very happy with this, but what we’re more curious about is your thoughts on this new design: do you like it or not?